The La Salle University campus in the Olney section of Philadelphia. The security update sent out by La Salle about 1 p.m. Friday. La Salle University was one of several U.S. universities receiving an email making a security threat, it notified students about 10:30 on Friday morning. "We are in process of determining whether the threat is credible. 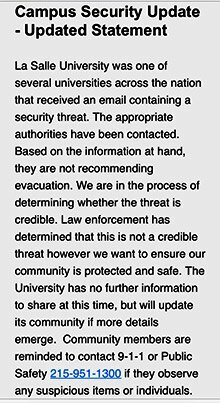 The appropriate authorities have been contacted, and are on campus at this time working with our department of Public Safety to ensure our community is protected and is safe," the campus security alert. "Based on the information at hand, they are not recommending campus-wide, lockdown or shelter in place," it continued. "The University has no further information to share at this time, but will update its community as more details emerge." 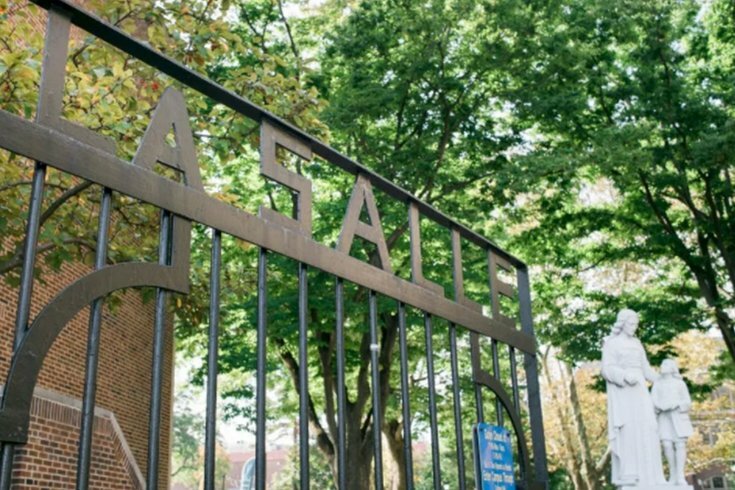 Contacted early Friday afternoon, Jaine Lucas, La Salle's chief communications officer, said she was in a meeting and could not immediately comment on the threat. A second alert went out about 1 p.m. that reminded the university community they should report suspicious items or individuals. The nature of the threat against La Salle was not immediately clear, nor was it known what other universities received the threat.